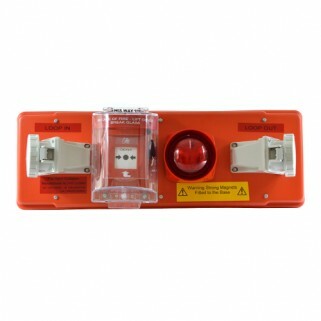 - The Fire Alarm Outstation is coloured red and vacuum formed from 4mm flame retardant ABS. - The housing is manufactured to IP44. This IP rating is due to the rating of the Manual Call Point, Combined Sounder and Flashing Beacon. 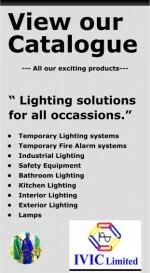 - Each Fire Alarm Outstation comes complete with two unique angled 5pin electrical sockets and two electrical plugs manufactured to BS4343. The electrical sockets and plugs when connected together with suitable cable will provide the electrical connection between the main fire alarm control panel, other fire alarm outstations, the loop circuit, fire alarm transducers for initiating the fire alarm, auxiliary circuits, audible and visual indicators. - To prevent ingress of moisture, a rubber gasket is fitted to the face of the box to which the lid is secured. - A Combined Flashing Beacon and Sounder is fitted to the front lid of the housing. Electrical terminations are made inside the outstation by means of suitable terminal connectors. - Two magnets are fitted to the base of the housing to allow the housing to be secured to the metal structure of the vessel. - Metal wire loops can be provided for a additional support for the housing. - Labels are fitted to the junction box to provide the identification and date of manufacture. - Labels are fitted to the box to indicate loop in and loop out. The Temporary Fire Alarm System is an intelligent electronic control system that is based on technology which is currently protecting the public and the workforce in a variety of environments such as hospitals, public buildings, underground railway systems and schools.